Despite health warnings and issues about raw meat feeding, there's a growing consumer interest, particularly among pet owners, for raw dog food diet. With constant dog food recalls, more owners are switching to feeding high-protein meals of mostly fresh meat just as the dogs' ancestors have been consuming their food for centuries. Raw feeders aren't the least bit bothered by the criticisms surrounding raw dog food diets. They will continue to feed their dogs raw meat over canned dog food or dry kibble since the latter is deemed more unhealthy, with ingredients always containing byproducts, fillers, preservatives and unhealthy additives. Dr. Anna Hielm-Bjorkman of the University of Helsinki is still in the midst of conducting her studies with her team at DogRisk on the difference between raw feeding and conventional kibble feeding. What they have learned so far is that a raw diet may help fine tune the dog's immune system so dogs could be less prone to skin allergies, according to her interview with Healthy Pets. Any type of food can have both a positive and negative impact on the dog's health. A lot of factors come into play when it comes to feeding because each dog's body is unique. But raw feeders are able to evaluate and adjust the type of food they give to their pets better than owners relying on factory manufactured dry kibble alone. As such, they can provide dogs with a more complete diet based on the individual dog's nutritional needs. Raw feeders who have been doing this for years understand that their dogs don't have to follow an exact diet like their ancestors, the wolves. It's also not advisable to stick to a diet that's purely based on what wolves eat because that will not satisfy the dog's other nutrient requirements. For instance, a dog that suffers from yeast infection might be given raw goat's milk to help his system. Some other foods might help the dog with different health problems. Wolves don't particularly digest raw goat's milk even if raw feeders give this to their dogs. Therefore, flexibility is essential and pet owners feeding raw diet are not opposed to that. So, in considering how to build your dog's raw food diet, you can use wild wolves as the foundation for the diet. But after that you must also learn to weigh the benefits and the drawbacks of certain foods that wolves may or may not eat because it can be good or bad for your dog's health needs, as well as evaluate your pet's current health condition. While meat is still the primary source of calories and nutrients among pet owners feeding raw, there's a growing number of owners looking into including a few other options. Plant-based foods are rich in vitamins, minerals, and nutrients. These are considered functional raw foods that provide some basic nutrition and compliment an otherwise meat-heavy diet. Same as with human diets, feeding dogs foods culled from plants may help lower their risks for diseases, according to a study in the Research in Veterinary Science. “Functional foods” help dogs thrive, not just survive. It is recommended that pet owners must also feed their dogs whole fruits and vegetables, and there's a number of studies showing the benefits that fruits and veggies have on dogs. Apple cider vinegar. It has antibacterial properties that help manage the dog's weight against diabetes development. A teaspoon of ACV may be mixed with the dog's food. Plenty of other uses of ACV have been found by pet owners, too. Coconut oil. It helps to improve the dog's skin and fur due to its antimicrobial properties. It also helps with the dog's digestive system and joint problems, among other benefits. Give half a teaspoonful of coconut oil to dogs twice daily. Garlic. This is a controversial one. Generally, garlic is a natural prebiotic that contains loads of vitamins and amino acids, but it's also known as being toxic to dogs. But some holistic vets claim that in small amounts it helps the dog's body detoxify because it's anti-parasitic and antimicrobial. Make sure that the garlic you feed the dog is organic and give no more than 3.4 grams. Also, different dogs will react differently to garlic. 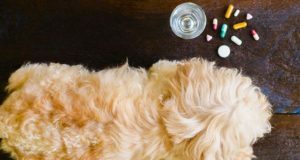 Although it's rarely fatal in small doses, even with a little serving the dog might experience stomach upset, diarrhea or episodes of vomiting. A study in the journal Interdisciplinary Toxicology stated that when given in moderation, garlic is safe for dogs. A garlic weighing 15 grams might be too big of a dose. Take note that a clove of garlic is about 3 grams. Mushroom is regarded as a superfood in the human diet because it's rich in nutrients. While there's no studies on this, some vets claim the same benefits for dogs. Note that there are many types of mushrooms that might be poisonous to dogs. When making your dog's raw meal, mix the portion up with liver, kidney, skin, ovaries or testes and brain, since these are extremely rich sources of vitamin B, iron, zinc, copper, DHA and vitamin D, much healthier than just muscle meat. If you decide to feed your dog raw diet, remember that these trends are just guiding principles and options to consider for your dog; they're not rules and the only law to follow is to adjust the diet based on your individual dog's needs. You and your vet are still the best people who can tell what’s good or bad for your pooch when it comes to diet.